There is a big difference between Zionism and Judaism. Judaism describes the Jewish faith whereas Zionism defines the philosophy behind an exclusive Jewish state which is the physical and spiritual homeland meant exclusively for the Jewish people. The latter is a very fundamentalist outlook, and is much reviled, particularly amongst the Arabs. 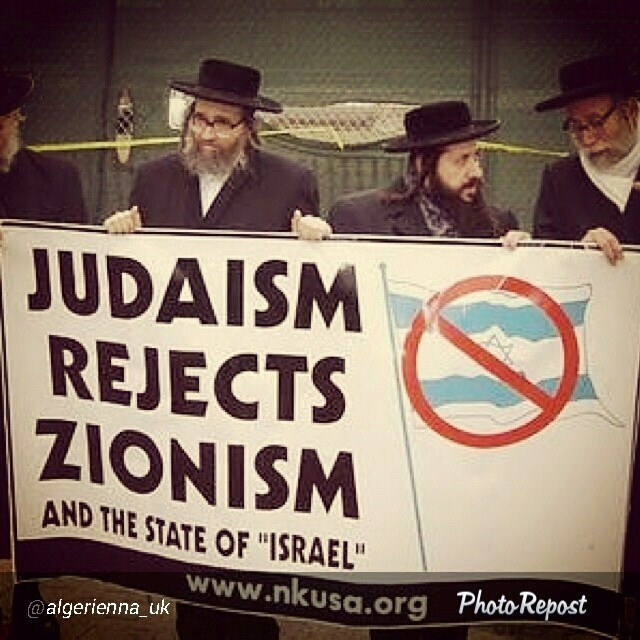 All Zionist are Jews, but not all Jews are Zionists. There are Jews in many parts of the world. Most of them live in Israel and America. Now all of them certainly believe in Judaism, but not all of them would subscribe to the hard-line exclusivist vision of the Zionists. The Zionist movement arose in Europe in the late nineteenth century out of a desire to end the exile of the Jewish people and return them to the holy land by force if necessary. Initially they found very little support among the Jewish populace but could make some impression after the horrors of the Second World War, as perpetrated on the Jews, made them pay heed to this notion. Judaism on the other hand simply means living by the tenets of the Jewish holy book, the Torah. Whatever befell them was the will of God, as expressed through the Torah and there never was any attempt to forge any sort of a national, political or sectarian agenda. Judaism as a religion is really a simple way of life, where man lives his life quietly and with dignity, while observing the traditional Jewish rituals that are ordained in the Torah. Zionism on the other hand speaks of the exclusivity of the Jews, their right on the holy land, the acquisition and conquest of lands held by other people, which is rightly their own. As opposed to a practitioner of Judaism, for whom a Jew is a person who believes in God, and strives to carry out his word, as passed down to him in the Torah. He does not think in terms of the lineage of a Jewish race which is separate from that of the others. A practitioner of Judaism will have a more nuanced approach towards life, as he would know that Jewish history is a rich, checkered and much splendored tapestry which plays out over many nations and regions. A Zionist on the other hand would have very little factual information about his people, but a fanciful notion about the origin of his race. The Jewish people or the followers of Judaism have often suffered persecution at the hands of European nations down the ages on account of their race. It is ironic that the Zionists among the Jews would show the same kind of hatred to other people, namely the dispossessed Palestinians. This is even more ironic for the reason that Asian nations were generally very tolerant of the Jews’ presence down the ages. According to the traditions of Judaism the task that God set before Jews was to set standards in the realm of spirituality and piety, and not to excel in military might or the mastery of high technology as a driver of force, as the Zionists proclaim. All in all Judaism is all about spirituality and piety while Zionism is about racism and expansionism. 1.Judaism describes the Jewish faith. Zionism defines the philosophy behind an exclusive Jewish state. 2.All Zionist are Jews, but not all Jews are Zionists. 3.Judaism is more about spirituality but Zionism is more about racism. Manisha Kumar. "Difference Between Zionism and Judaism." DifferenceBetween.net. April 4, 2019 < http://www.differencebetween.net/miscellaneous/difference-between-zionism-and-judaism/ >. Great Article. I never knew what a “Zionist” was but have been hearing the term used alot lately. I thought all Jews were Zionists. I’m glad I found your article. All practicing Jews believe in the Messiah, and that the land of Israel will be returned to them, eventualy. Jews have prayed to God for thousands of years to return them to their land and to rebuild the temple. Zionism, is the movement to take back the land without waiting for the Messiah to do so. Zionists can be either religious or non religous. That is the whole story. This article, unfortunately, includes a lot of unnecessary bias. I’m not an authority, however I want to tell you that I agree only with your 1st & 2nd sentence. The thing brother HaLeivei is that the Messiah (Jesus peace be upon him) will take back the land of Israel, but with the Muslims. He will also kill the False Messiah. One does not have to be Jewish to be zionist. This article was obviously written by 1) a non-Jew 2) a non-Zionist 3) a person with distorted views on both subjects. In fact, their prejudice is painfully transparent. Zionism is the movement to rebuild the Jewish homeland in their ancestral land – a land from which they never relinquished their claim, and in fact, there have always been Jews living there. is NOT a jewish state! One and for all!! All Zionists are jews? I am totally opposed! According to the halacha someone who does’nt belive in the thirteen principles of the jewish faith posted by Maimonides (known as the “13 IKKRIM” ) is considered as a heretic and is excluded from judaism, that means that all zionists becouse of their heresy are not jewish people although they have also many religious people, that makes no difference. A very poorly written article. False. Many Christians and Muslims are Zionists too. An unqualified sweeping assumption, especially considering its contradictory nature. Zionism is rooted in the Hebrew Bible, which is in itself factual information about the Jewish people. Correct your mistakes and rewrite your article, maybe even read a book about the religion before you try to misrepresent it every again. “All Zionists are jews? I am totally opposed! Besides which loving God which ever advocate the killing on innocent people, Guess history repeats itself and you Zionists will be expelled from the holy land by god one more time, this time for good. Thank you Sameera. I think @efra also mentionied this point, no? I think the author was helping to give a modern historical account and had some valid points. I suggest that only those Jews who actually practice live and breathe their religion are those whom God is interested in saving. The intentions of the heart is what matters. Thats how i perceive of the written Word. G-d will save all people, since all humans are created and loved by G-d. This article is wrong on many levels. The blanket statement made that all Zionists are Jews but not all Jews are Zionists, is incorrect. Many Christians and Muslims live, work and play as Israeli citizens and even serve in Israeli government. Next fallacy is Zionism is racism. The previous statement directly refutes that along with the proof of Ethiopian Jews and their return to the Jewish homeland. Many Muslims and Christians support Israel, usually the most educated ones. If you even read the Quran, you would see the fact that Israel is indeed the land of the Jews. You ignore your own religion. Your religion obviously doesn’t mean much to you. The article begins with slander: “Zionism defines the philosophy behind an *exclusive* Jewish state which is the physical and spiritual homeland meant *exclusively* for the Jewish people,” which shows the author lack of honesty and biased against Israel (the direct result of Zionism). Even Wikipedia has it right: “Zionism (Hebrew: צִיּוֹנוּת, translit. Tsiyonut) is the national movement of Jews and Jewish culture that supports the creation of a Jewish homeland in the territory defined as the Land of Israel.” There are millions of non Jews living in Israel (or the “Zionist Entity” as Islamo-fascism calls it). The author also shows a complete ignorance of Judaism. Don’t believe a word he writes. real owners the Palestinians forcefully with the help of mighty US military. This is wrong. I am Jewish and at least half of all Jews live outside Israel/Palestine, if we wanted to be Israeli we could automatically be according to the country’s rules – but we don’t want to be. Only when the Messiah comes and restores the Temple will it have a connection to all Jews. In that time there is no reason for any people to be excluded from living there, since all humans are the children of G-d. This article is incredibly biased and incorrect. What drivel. Of course all zionists are not Jews. If you ever read any prayers from the Torah or seen any Jewish service you’d know that every other sentence mentions Israel. I want a 2 state solution but one of those states should be a Jewish state, does that make me a Zionist? Is that a bad thing? If it is we better tell the “Palestinians” (please remind me what the letter “P” in Arabic was again) they can’t have a Muslim state because it’s racist. Also we need to say the same thing to all Muslim countries. Also what is this luddites problem with advancing technology and having a good military when historical precident shows attempted invasions by ALL of your neighbours!! As a non Jew and not what you could call a practicing Christian, I am surprised at the conflict present in what I thought to be the most homogenous group of people on the planet. i now understand why in my country it seems that Jews tend to lean to the left politically which seems to me a form of suicide based on what has happened in the past when countries go too far to the left. The Jews are usually some of the first to be persecuted. Not so much as their religion, but more because Jewish people tend to have higher IQ’s which makes them instant enemies of totalitarian governments. If the chosen people of God cannot agree on basic principles, how can the rest of the world have any hope of peace? Zionist were called the worlds first terrorists (re: the murderous stein gang), that fact is true even today, zionist are thieves, racists, their aparthied system is about hatred for all non zionists, Netanyahu has even created laws based on the Nazi Nuremberg Laws, he is a right wing fascist who reaches out to others of similar belief. He is the new Hitler and the Israel army are his gestapo fiends. Not all Jews “certainly believe in Judaism”. I know at least two Jewish people who are atheists.